According to DB guideline 824.5010, the manufacture of the tension equalisation must be monitored and documented by an approved construction supervisor. 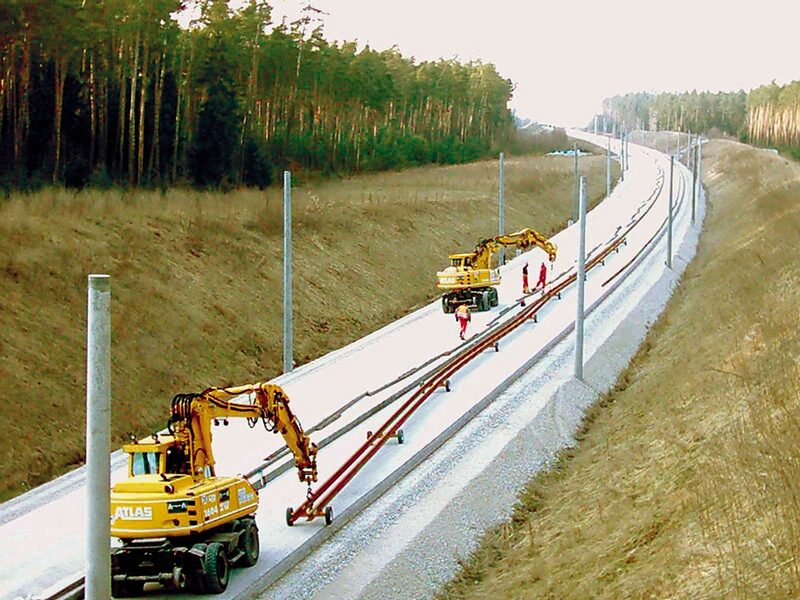 At the same time, our specialist site managers are qualified as master welders for the permanent way and are therefore also in a position to coordinate the optimum processes for the construction of the gapless track in coordination with the permanent way. This considerably relieves the client’s construction management, enables all work to be carried out smoothly and has already saved many a shutdown break. The specialist site manager for tension equalisation / master welder for superstructure at Klaus Thormählen GmbH is your competent partner for all questions and procedures that have to be clarified directly on site and are therefore indispensable. According to DB guideline 824.5010, an approved construction supervisor is required to monitor and document the manufacture of the voltage equalization. At the same time, our specialist site managers are qualified as welding supervisors for superstructures. This enables them to coordinate the processes and interfaces on the construction site. Track construction and welding technology work hand in hand. This relieves the site management considerably, optimises the performance on site and has already saved many a closing break. The specialist site manager for tension equalisation / master welder for superstructure at Klaus Thormählen GmbH is your competent partner for all questions that have to be decided directly on the construction site and are therefore indispensable. When constructing a gapless track, the rails must be braced to the length they have at the mean temperature prescribed for the respective region. The rails are elongated by heating or hydraulic drawing. If the customer wants to carry out the length compensation himself, we offer the provision of the necessary equipment including the gases. For rail lengths of up to 1000 m rail / shift, the use of heat pipes is recommended; for lengths longer than this, the use of a heat trolley is economical. The cold drawing device is used above all for particularly high temperature differences and in regions where the length compensation with the cold drawing device is prescribed by the railway operator. The production of a gapless track is the original task of a specialist welding company. If all services, from releasing the rail to producing the voltage equalisation, the proper welding of the joint, the re-tensioning of the gapless track as well as the monitoring and documentation of all processes are in one professional hand, it is ensured that both the quality and the service can develop optimally. The site manager can concentrate on the coordination of the superstructure and has a competent welding master at his side. Experience shows that an optimal result can be achieved for the entire construction site, both economically and in terms of the process, if the complete performance of the construction of the gapless track is in one hand. The teams of Klaus Thormählen GmbH are your partners for the successful execution of complex construction projects. Our framework contract partners in particular have repeatedly achieved excellent results through their experienced partnerships in the interaction of the trades. Benefit from these experiences.